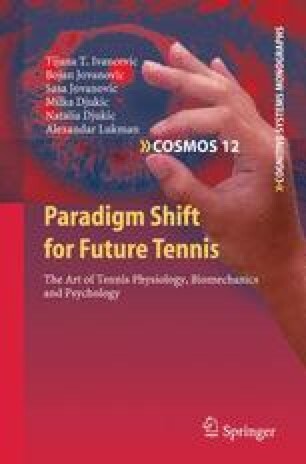 Classical tennis serve has three stages: (i) the ball toss, (ii) the jump, and (iii) the finishing smash. (i) In the case of a right–handed player (like Federer), the ball toss is thrown with the left arm. The feet are apart, and the ball toss is performed with the contractions of the left deltoideus, the biceps and the palmar flexors muscles. This movement is done simultaneously with two other preparatory actions. The first one of these preparatory actions is raising the right arm, “loading”. The muscles used to carry this out are the right deltoideus, supraspinatus (a muscle going over the shoulder blade) and the biceps brachii. The second action is bending the knees, and thus preparing for the second stage of the serve (the jump). There are no flexor muscles used to bend the knees, for the bending of knees is accomplished by gravity alone (actually, leg–extensors are used in eccentric fashion). (ii) The first–serve jump is performed high and forward. It is achieved by instantaneous actions of all the leg extensor muscles; left and right soleus, quadriceps femoris and gluteus maximus muscles. Jumping is the second part of “loading” in the serve. At the same time as the player lifts off, the racquet is placed behind the body, in a “back–scratching” position, and the right shoulder’s rotation towards the ball begins. This movement involves the right biceps brachii and wrist extensor muscles. While in the air, the feet naturally join together (with Federer, the feet join in the air, not on the ground). (iii) The finishing smash takes place in the air, before the player returns to the ground. To end the serve, the shoulders are rotated and the ball is hit simultaneously. By then, the shoulders should have been fully rotated and the feet prepared for landing. The internal and external obliques abdominal muscles complete the shoulder rotation. Hitting the ball is performed by the latissimus dorsi, then pectoralis major and finally triceps brachii muscles. To add a bit of spin or slice to the serve, the wrist is flicked slightly at the end, using the palmar flexors.